It's a sweltering hot summer here in Maryland! And every year right about mid July I start to daydream about cool crisp fall air, and snuggling up on the couch with my hubby and kiddies to our favorite Halloween movies! 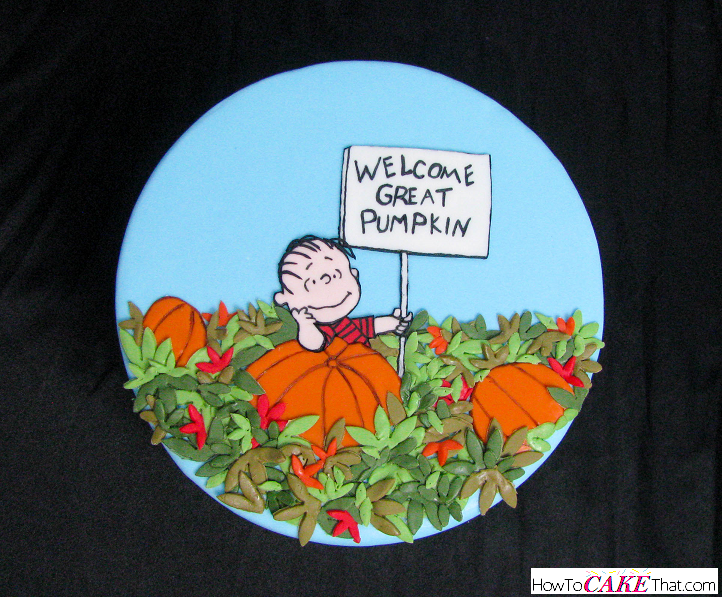 One of our top favorites is "It's the Great Pumpkin, Charlie Brown". 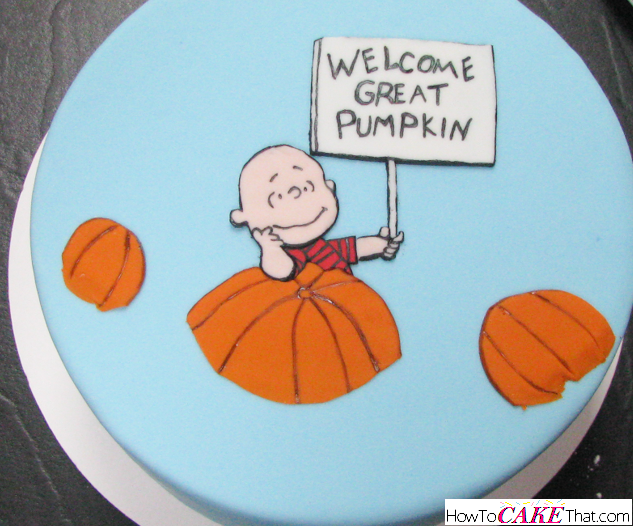 And yesterday I had some free time and some extra cake supplies on hand, so I decided to create a cake decorated after one of our most loved fall movies! 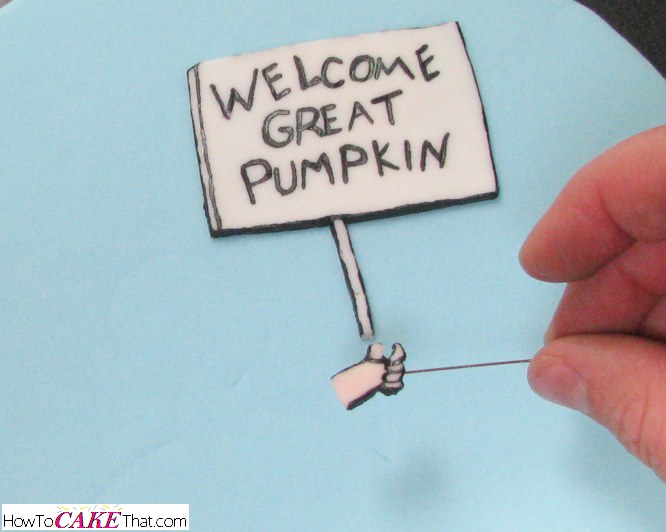 And of course I took photos of the decorating process to share with you guys! I hope you enjoy! 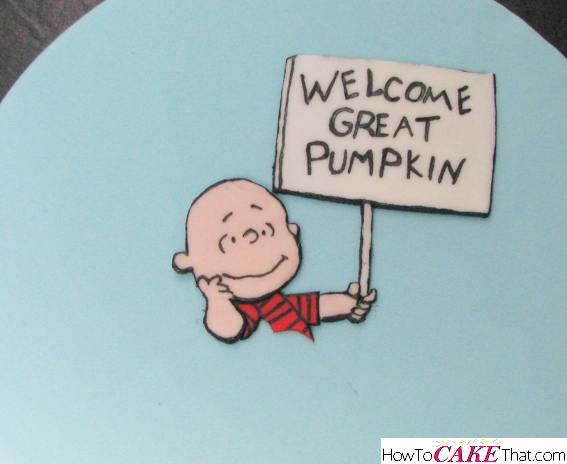 I wanted this cake to look exactly like the scene from the pumpkin patch where Linus is holding the "Welcome Great Pumpkin" sign. It's so cute, and he looks so happy and hopeful! So to get this nice clear photo, I popped the DVD into the laptop and waited for this scene to come up. I then paused the DVD and took a screenshot of this scene and pasted it into Paintbrush. If you'd like to use this exact shot that I'm using, please feel free to download this image by clicking the button below. I already have it sized just right for an 8" round cake. 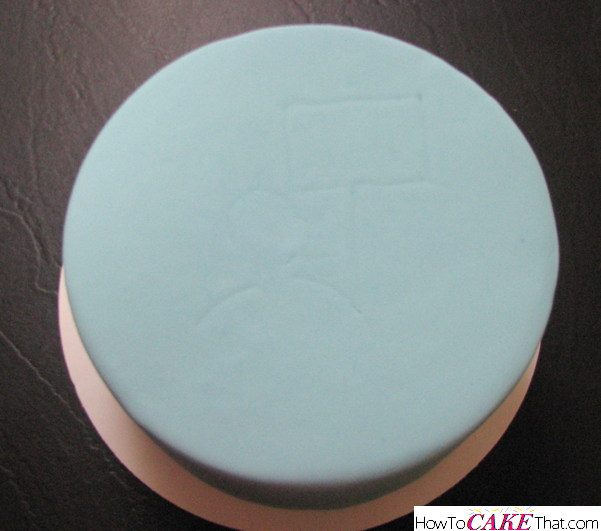 So here I have an 8" round cake already covered in sky blue fondant. 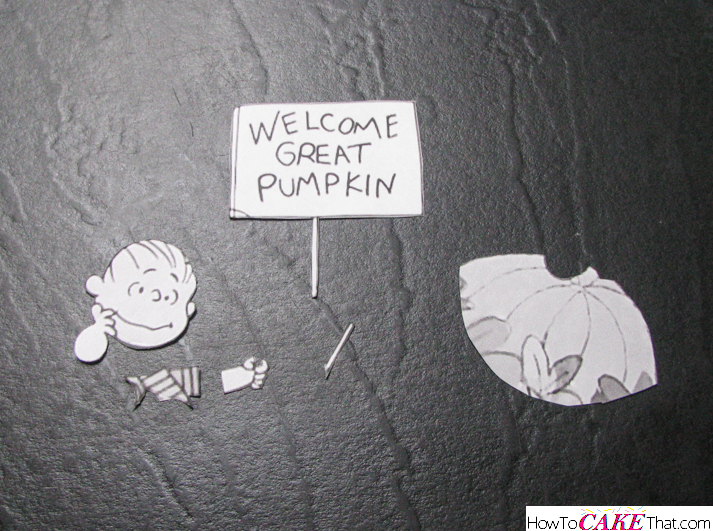 Next, I trimmed the paper just around Linus, his sign, and the large pumpkin. This will allow me to center the main focus of the cake. 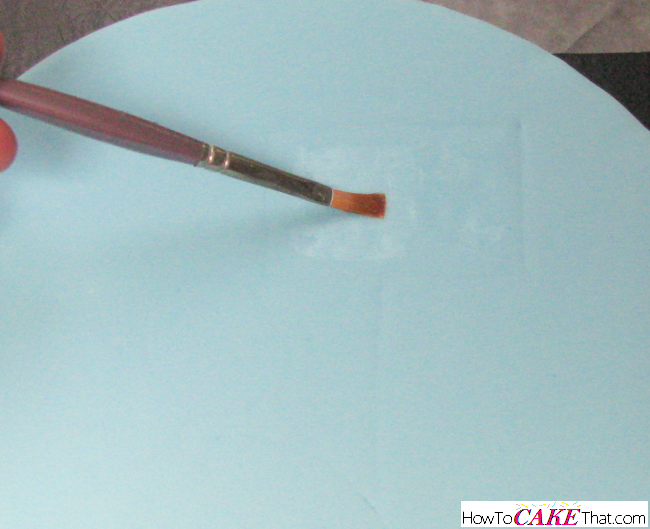 I then, with a large soft brush, lightly dusted cornstarch on the surface of the cake where the paper would be sitting to prevent the paper from sticking to the cake. 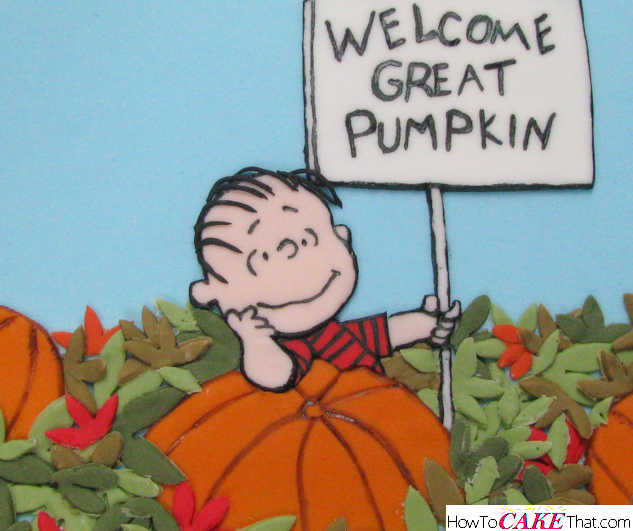 Next, using a pointed cake tool, I traced around just the outside edges of the main items in this photo - the sign, Linus' head, and the pumpkin. 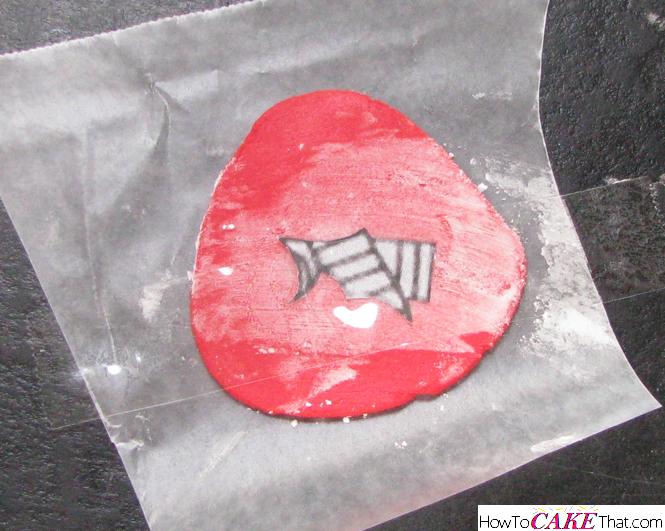 I pressed just firm enough that it left guide marks in the fondant. 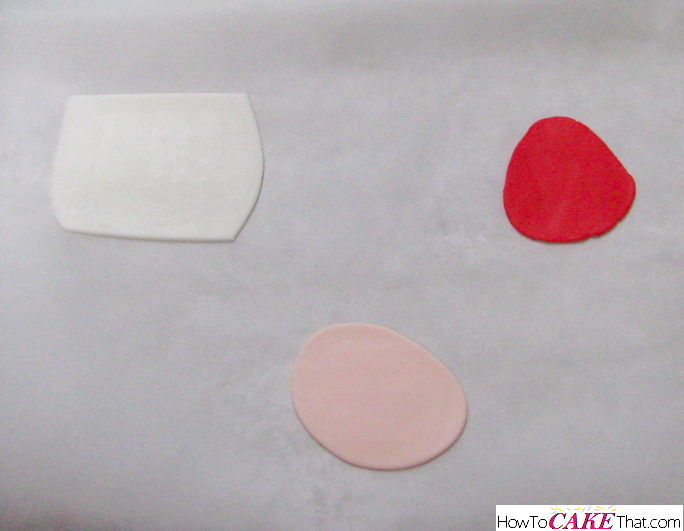 Now I have perfect guide marks so I can easily place my cut pieces on the cake and ensure they end up where they are supposed to sit. 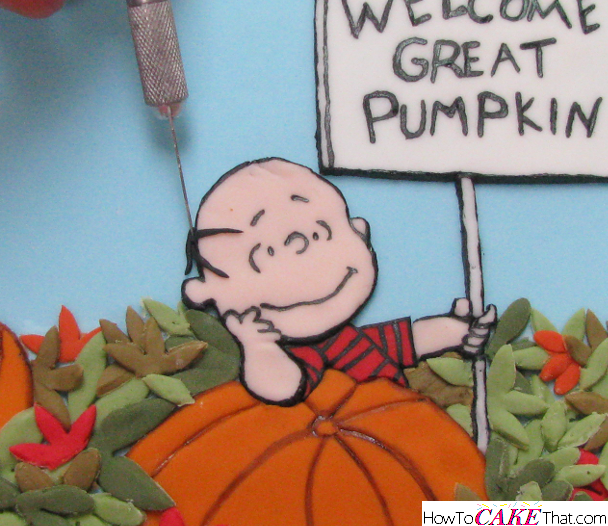 Next, I colored a very small amount of fondant in the colors needed for Linus's face, arms, and shirt. For his face and arms, I find that just a touch of Wilton gel color in Copper gives the perfect flesh tone. 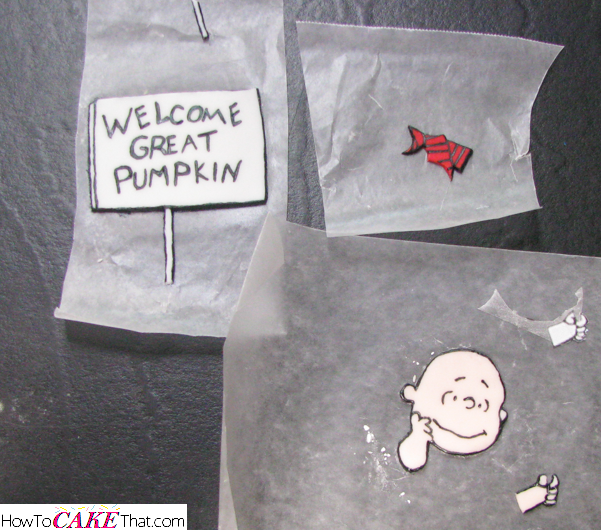 I then rolled out the skin color, red and a bit of white on a sheet of parchment. 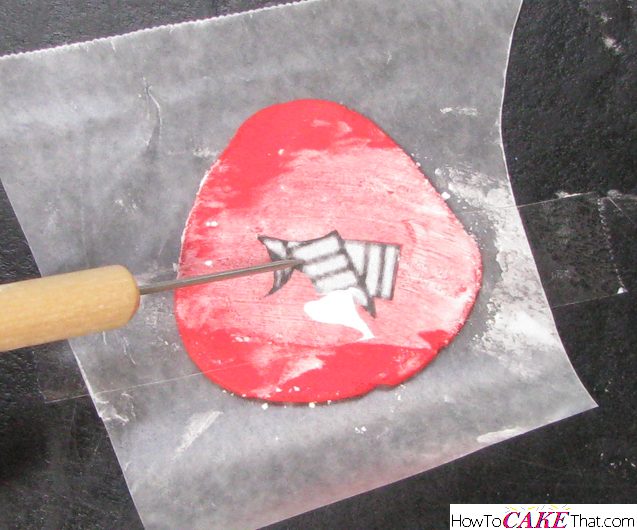 I then placed the parchment into the refrigerator to firm up the fondant for cutting. Meanwhile, I cut out different sections of the picture. I made sure each piece was cut out by color. Now I'm going to begin working on the little sign. 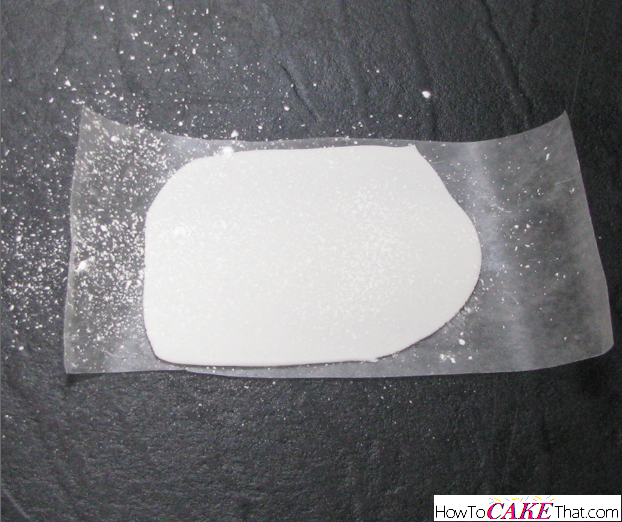 I removed the white fondant piece from the refrigerator and placed it on a small piece of wax paper. 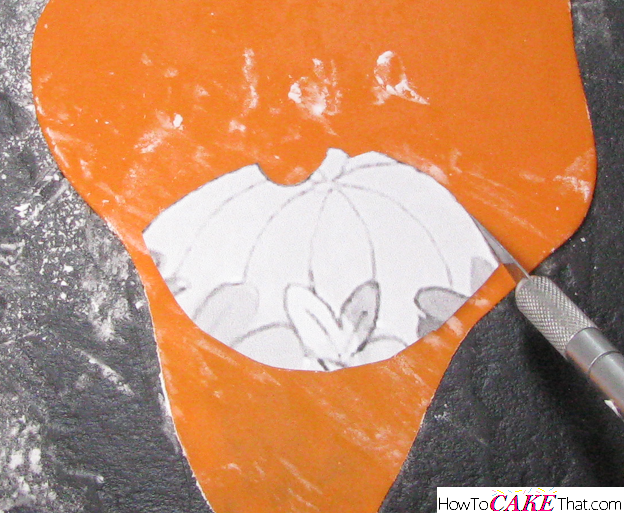 I then dusted the surface of the fondant with cornstarch to keep the paper from sticking to the fondant. 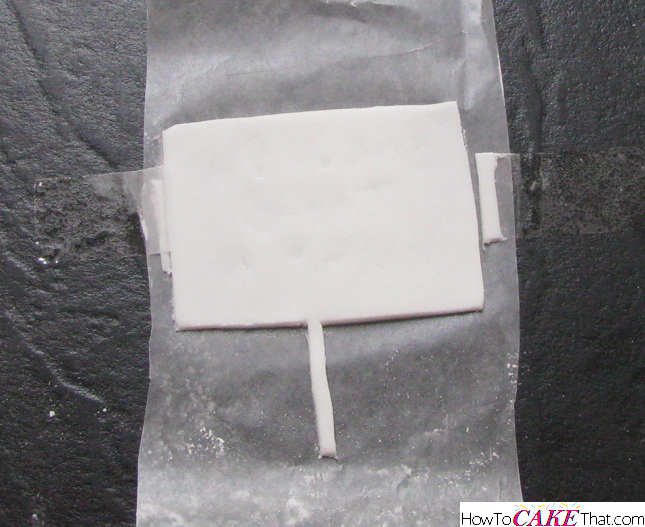 I then placed the paper sign on the fondant and taped it down to keep it from moving around. 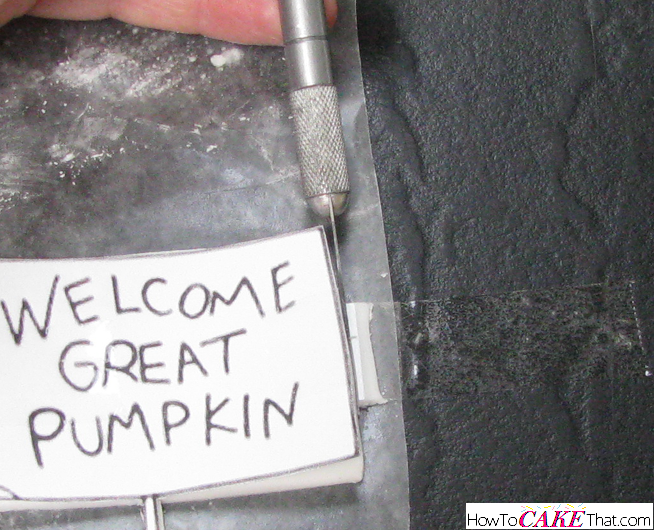 Next I used a scriber to trace over the letters. 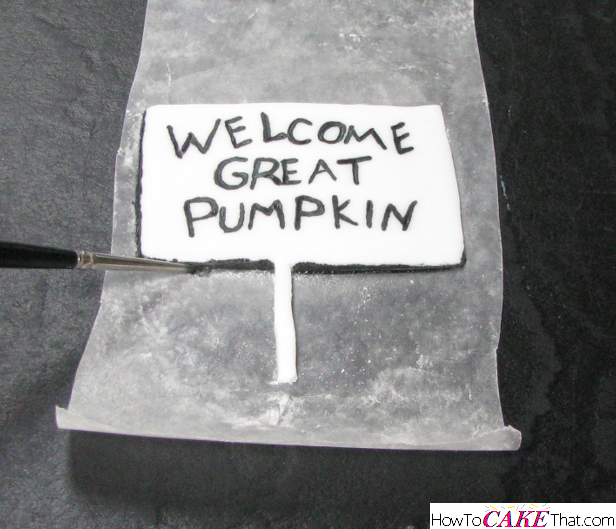 This will leave an impression on my fondant so I'll know where to paint the letters later. 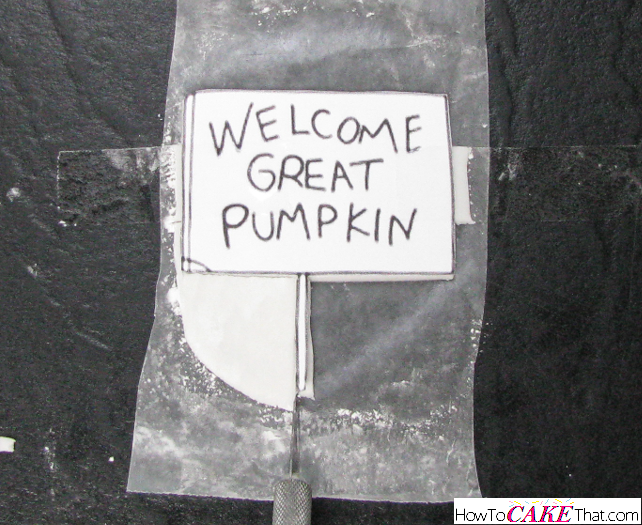 Next, I used an Xacto knife to trim the fondant around the edges of the sign... except for the pieces covered in the tape. 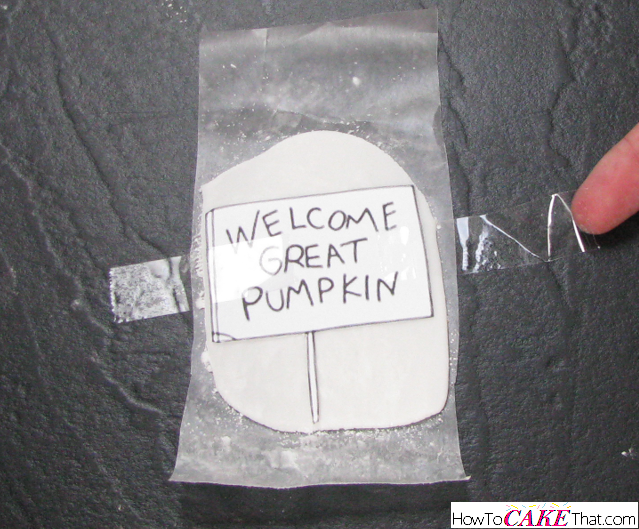 I saved the tape covered pieces for last to ensure the sign would stay put until the last possible moment. Repeat the above steps with Linus' shirt and his face, arms and hands. Next, using a mixture of Wilton gel food color in black and a little bit of vodka, I created a paint and painted the details on all of the little pieces. Now to place all of the little pieces onto the cake! 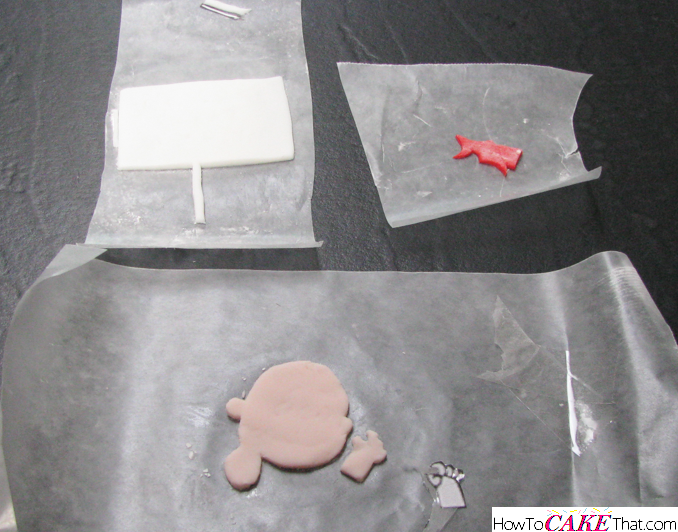 I brushed shortening on the areas that will have the fondant decoration pieces on them. 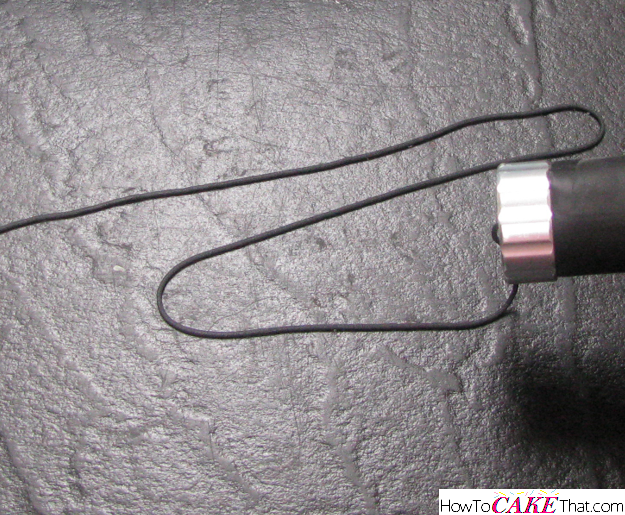 The shortening allowed me to slide the pieces around if they needed to be adjusted a little. For large pieces, I picked them up and placed them on by hand. 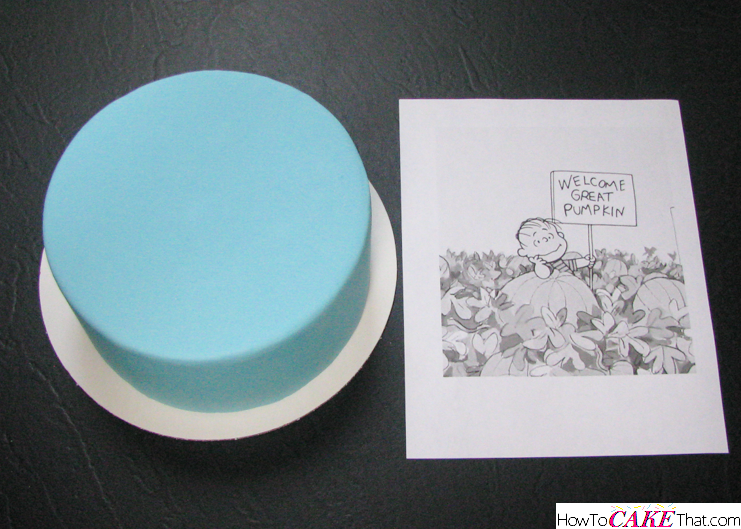 For the smaller pieces, I stuck a needle in the edge of the piece to help lift and place it on the cake. 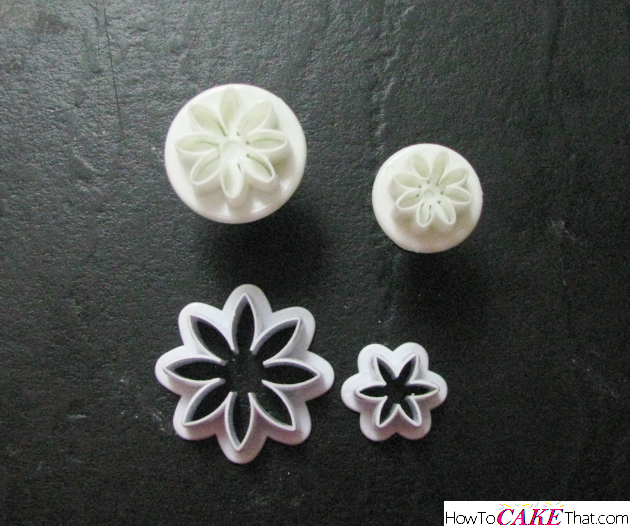 Fortunately I was working on all of these pieces the same day... so when it came to fitting the pieces together, the fondant was still a little soft and allowed for a bit of shaping, so the pieces could fit together seamlessly. 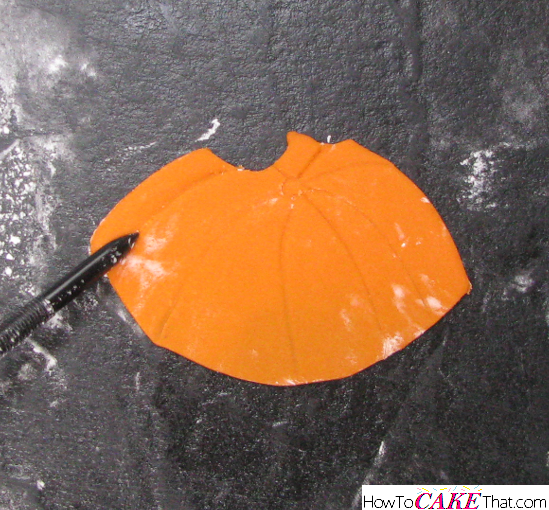 To make the pumpkin, I rolled out a little orange fondant and cut around the template with an Xacto knife. 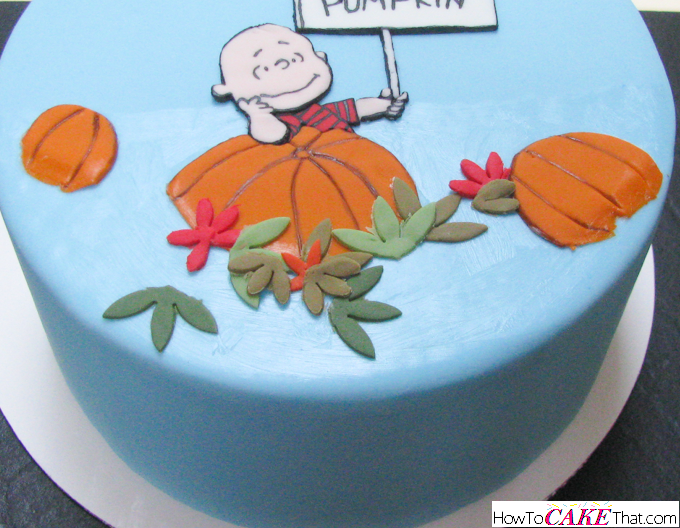 I didn't refrigerate the fondant this time since the pumpkin doesn't have to be exact. 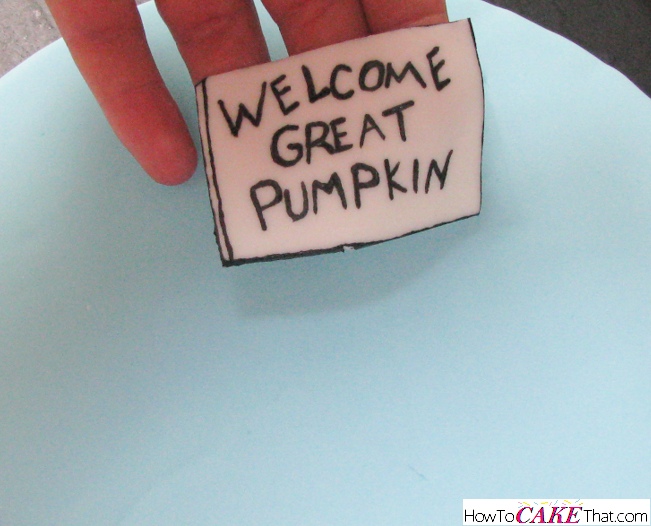 Next, I used a pointed fondant tool to create the little lines in the pumpkin. 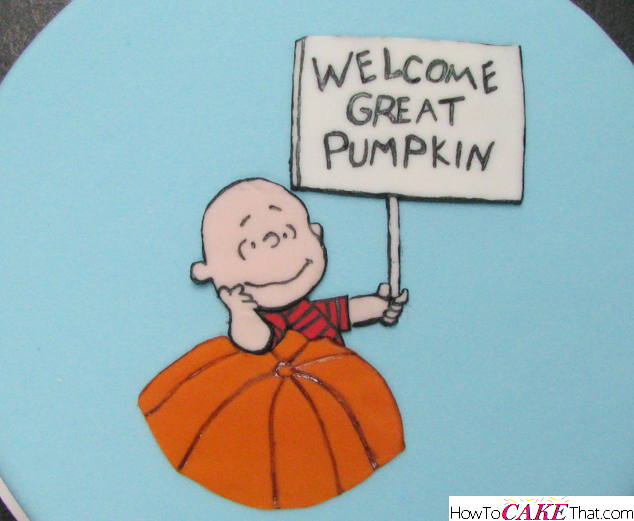 And to make it look like the scene from the Great Pumpkin, I created a paint with Wilton gel food color in brown and vodka, and painted the lines on the pumpkin. 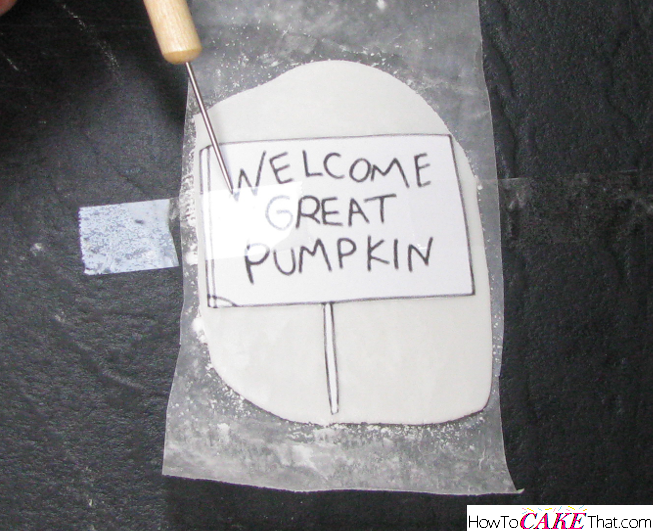 Then I made two other pumpkins using the same method. 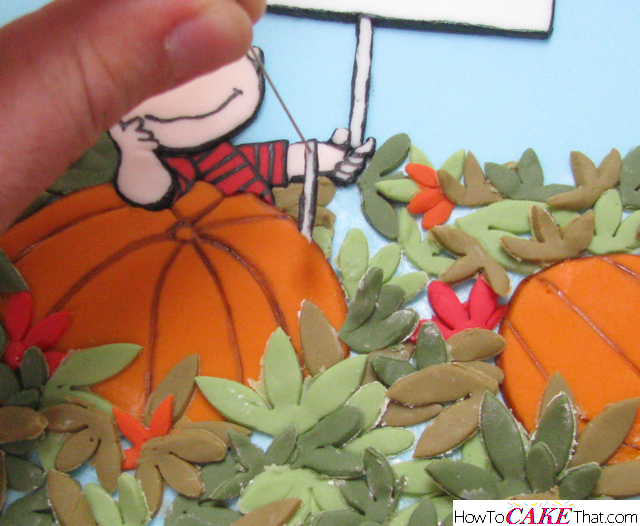 To create all of the filler leaves in the pumpkin patch, I colored fondant in different shades of green, and red and reddish orange. 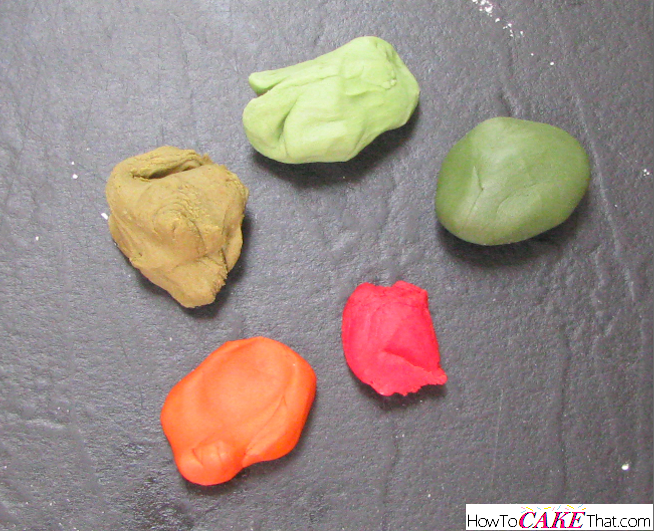 I used Wilton gel colors in Juniper green, Moss green, Brown, Red, and Orange. 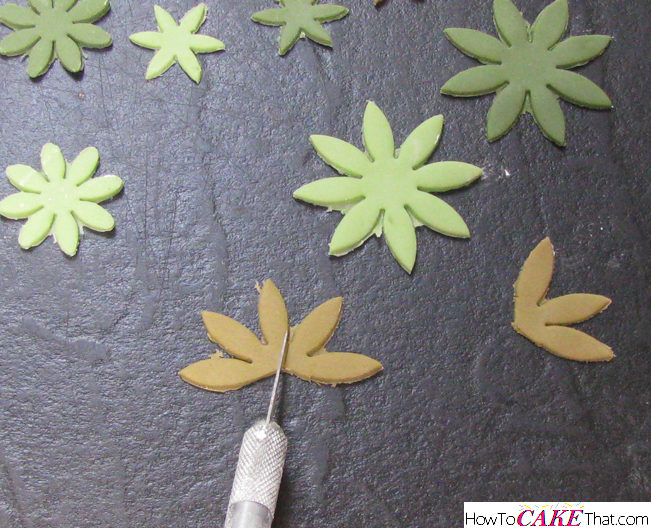 To make the leaves as quickly and easily as possible, I found a few random flower cutters that would work nicely. 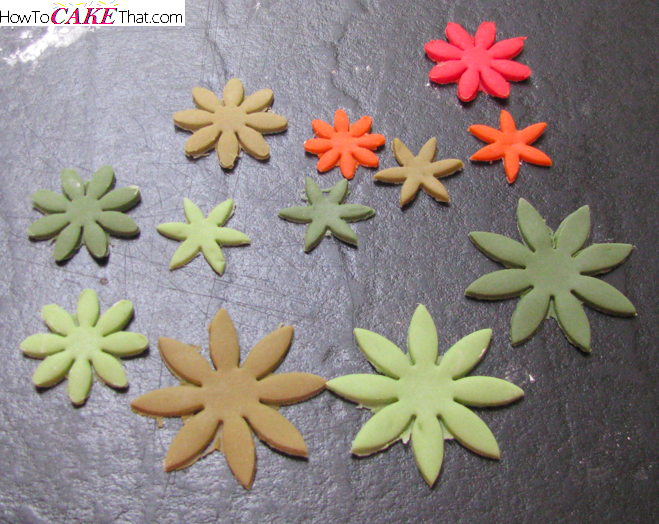 I cut out flowers using mostly the greens and brownish green. Then just a few with the reddish orange and red. 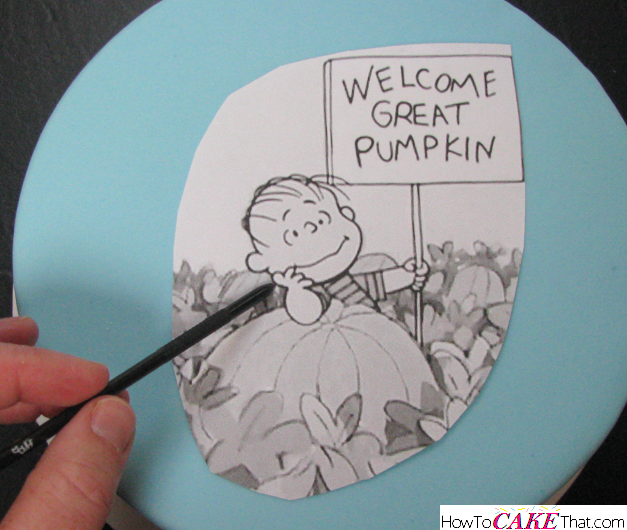 I then used an Xacto knife to cut the flowers into 2 and 3 leaf sections... just like what is seen in the movie scene of the pumpkin patch. 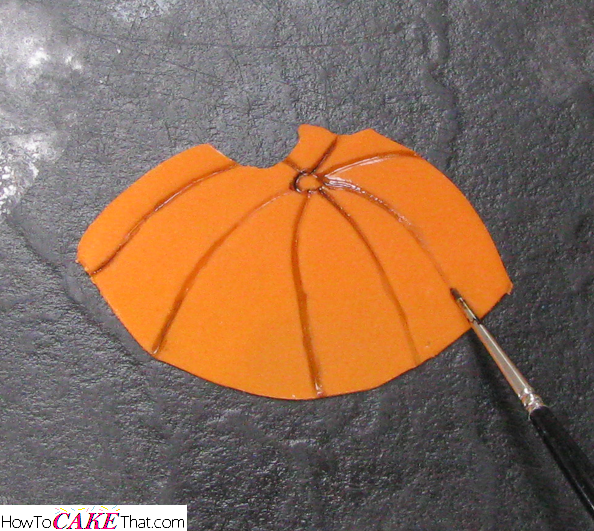 Then I brushed the area of cake that will have leaves with a thin layer of piping gel. 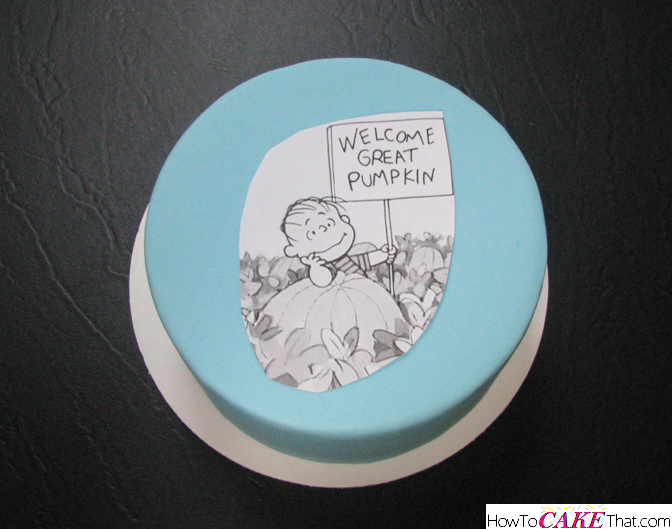 I then placed the leaves on the cake. Oops! I almost forgot the bottom half of his sign pole! And to fill in the little blue spots, I cut small individual leaves to cover them. 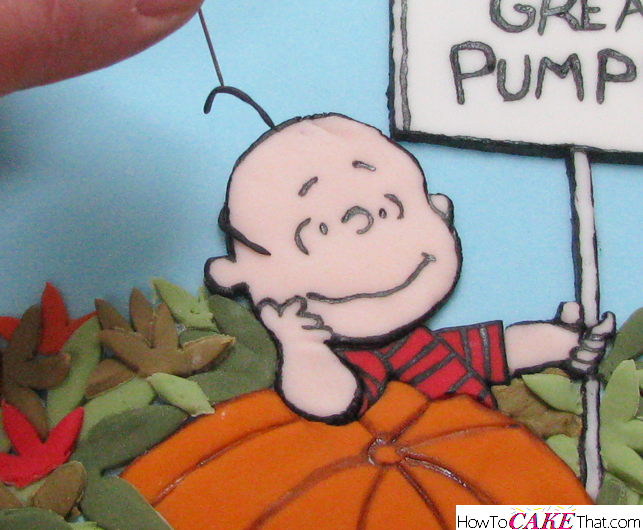 And to create Linus' hair, I pressed black fondant through the tiniest round disk I could find for my extruder. Then I brushed a small amount of piping gel on the top of his head (just where the black painted part is) to help hold the hair pieces in place. Then I trimmed small pieces of fondant string, rolled one end between my fingers to make it come to a point, then used a needle to help put the hair in place. And if pieces were too long, I carefully trimmed them away with the Xacto knife. It was like performing surgery, but phew, I'm done! And to get rid of any cornstarch on the leaves, I just brushed over them lightly with a little alcohol.